Trying to lose weight after you give birth can be a challenging process, but you can lose your pregnancy weight without resorting to herbs and supplements. The average woman who starts her pregnancy at a normal weight only loses 80 percent of her weight gained during pregnancy, and an obese woman only loses 60 percent of her pregnancy weight, according to the Minneapolis Department of Health and Family Support. Getting back to your pre-pregnancy weight can help you feel better about yourself, give you more energy to care for your baby and avoid some of the health risks associated with being overweight or obese. Determine whether you are physically ready to lose weight after giving birth. The pregnancy website Baby Center recommends waiting until after your six- or eight-week check-up to begin dieting. Decide on your goal weight. If you were a healthy weight prior to your pregnancy, set your pre-pregnancy weight as a goal. If you were overweight before getting pregnant, ask your doctor or midwife for a healthy weight range for your height and age. Eat between 1,800 to 2,200 calories a day if you are breast-feeding to ensure your infant has adequate nutrition. Eat at least 1,200 calories a day, if you are not breast-feeding. Both these calorie levels will enable you to lose about 1 to 2 pounds a week, which will get you to your goal weight relatively quickly. Your calorie needs may vary from these amounts, so ask your doctor or dietitian how many calories you need for healthy weight loss. Plan three low-calorie meals each day that feature natural, rather than processed foods. Choose natural breakfast foods such as steel-cut oats, bran or shredded wheat cereal or egg white omelets. Select lunch meals featuring whole-grain breads and wraps, baked chicken or seafood, green salads and whole fruit. Fill half your dinner plate with vegetables and fruit, and use one-quarter of your plate for a lean protein, and one-quarter of your plate for a whole grain. Avoid high-calorie foods that do not fill you up. Eating desserts, chocolate candy, chips and fried foods will make it difficult for you to keep your calorie intake to a weight loss level. Choose low-calorie fruits as desserts, and baked chips or baked potatoes over deep fried foods. Incorporate exercise into your day. 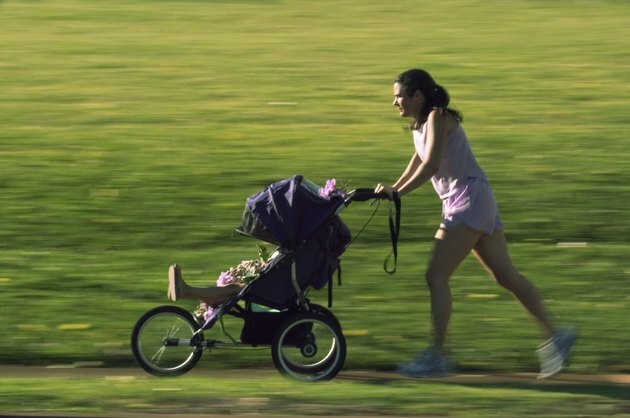 Take the baby for a walk in a backpack or sturdy stroller, or use your lunch hour to walk for exercise. Lift weights every other day during the baby's nap time or first thing in the morning. Weigh yourself about once weekly. Regular check-in times on the scale will enable you to monitor your weight loss progress and ensure you lose weight at an appropriate rate after giving birth. Drink water throughout the day to help you stay hydrated and feel full. Avoid excessive caffeine if you are breast-feeding. Prepare several meals in advance to help you avoid eating high-calorie fast food after a busy day. Add more calories if you begin to lose more than 2 pounds per week. Always follow your doctor's advice on weight loss after pregnancy.